Android Nougat 7.0 ROM, LG Gpad 7.0 AT&T CM14/CyanogenMod 14 has come through UNOFFICIAL CyanogenMod update. For latest updates, stay tuned to the Lineage OS device list page. This Nougat 7.0 is for LG Gpad 7.0 AT&T CM14/CyanogenMod 14 ROM. Since Google released Android Nougat Source code, we have update many Android NOUGAT AOSP ROMs and we also have a big list of Available CM14/CyanogenMod 14 Nougat 7.0 ROMs. This CyanogenMod 14/CM14 for LG Gpad 7.0 AT&T is brought to you by developer javelinanddart. If you like this Gpad 7.0 AT&T CM14/CyanogenMod 14 Nougat 7.0 ROM by javelinanddart then you can Donate the developer to keep up his good work. Donate to javelinanddart via Paypal. Download and Copy the GApps and LG Gpad 7.0 AT&T (v410, e7att) CM14/CyanogenMod 14 ROM ZIP to your phone. Reboot and Enjoy the Nougat 7.0 CyanogenMod 14/CM14 for Gpad 7.0 AT&T. 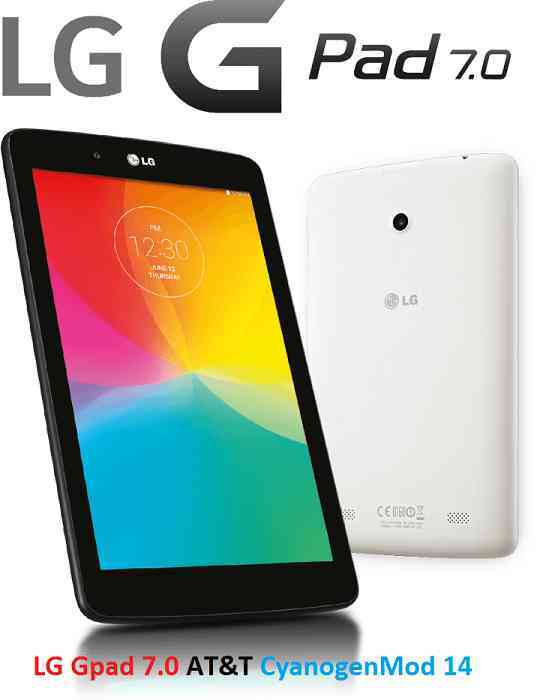 Copy the latest LG Gpad 7.0 AT&T CM14/CyanogenMod 14 ROM ZIP file to your phone. Stay tuned or Subscribe to the LG Gpad 7.0 AT&T (v410, e7att) forum For other Android Nougat ROMs, CyanogenMod 14 ROMs, other ROMs and all other device specific topics. Thanks for the ROM. The only issue I found was movies and TV episodes would not play in the Google Play Google Play Movie and TV app. Other than that my tablet seemed faster than before. I tested WIFI and wireless data and they both worked. I did not test Bluetooth. not sure what the cause of this is, but google play services crashes no matter which version of GAPPS 7.0 i use. prior to flashing gapps, rom works flawlessly. Hi. I followed the details and now I cannot get into recovery and my tablet is not recognized. Any ideas how to solve?